There were many royal Olavs in Scandinavia, but none so glorious and holy as Olav Haraldson, successor to Olav Tryggvason (King Olav I of Norway). Both became Christians, but while Tryggvason was inordinately cruel in his forcible conversion of stubbornly pagan chieftains, Olav Haraldson sought to aid already Christian kings. Olav was born in 995, the son of Earl Harald Grenske. His early youth was spent as a pirate—among those wild Vikings who made raids and fought battles against the Anglo-Saxons. There in England Olav became interested in Christianity, and in 1010 he was baptized in Rouen, France. In 1013, Olav helped the pious Anglo-Saxon King Ethelred in his fight against the raiding Danes. In 1015 he succeeded to the throne of Norway. In his efforts to unify Norway and bring all to Christianity, Olav brought many bishops and priests from England. Some of these are known by name, such as Grimkel, Sigfrid, Rudolf, and Bernhard. Thus, Olav attempted to form the ecclesiastical order in Norway after the Anglo-Saxon model. Clan rule and its pagan inspiration were too strong, however, and with the help of still pagan Danish and Anglo-Saxon kings, the Norwegian clans expelled Olav. He fled to Kievan Rus’, where he was propably given hospitality by Yaroslav, the son of Grand Prince Vladimir, now known as Equal-to-the-Apostles and Baptizer of Rus’. On his way to Kiev, Olav spent some time in the Nerike Province of Sweden, where tradition has it that he baptized many locals. Clan rule was very strong in Norway, and it prevailed over Olav and his nascent Christianity. But as the ultimate unifier and tamer beyond the grave of these barbaric, brutally pagan Viking chieftains, he is honored today even by a Lutheran Norway as its patron saint and Rex Perpetuum Norvegiæ—eternal king of Norway. Belief in Olfav’s sanctity spread very quickly, as there were many miracles associated with his death and translation of relics a year later. In 1075 his incorrupt body was enshrined in what became the cathedral of St. Clement in Nidaros (now Trondheim), and became a pilgrimage site. He was especially venerated during the reign in Norway of his son Magnus, and his feast was celebrated throughout Scandinavia. His relics were reburied after the Protestant Reformation. St. Olav is now venerated by Orthodox Christians as one of the pre-Schism saints. The translator of Church Slavonic texts Reader Isaac Lambertson has composed a service to St. Olav, which we are posting here from the website Orthodox England. With what wreaths of praise shall we crown the righteous Olav, for whose sake we celebrate today: the pillar of piety, the adornment of his people, the true advocate and intercessor for all Christians, who shone forth with splendour in his martyrdom? For Christ our God, Who hath great mercy, hath truly crowned him with a diadem of glory in the highest. With what hymns of laudation shall we praise the holy passion-bearer Olav, who as an athlete of the Lord contended lawfully, fighting the good fight and finishing the race, for which he hath received the wreath of victory from the Judge of the contest? For Christ our God, Who hath great mercy, hath truly set him among the saints at His right hand. With what vesture of hymnody shall we array Olav the blessed king, who, full of love for the Master of all, planted the seed of the Christian Faith in his homeland and watered it with his own blood, thus bringing it to goodly fruition? For this cause, Christ our God, Who hath great mercy, hath truly clad him in the bright raiment of gladness on high. In the blossom of thy youth thou didst cause the fear of the Lord to dwell within thy soul; and moved by zeal for His righteousness, thou didst not wander from the straight and narrow path of His commandments, O most blessed king; wherefore, cleaving unto Christ, thou didst lay down thy life for Him with gladness; for which cause the garden of paradise hath received thy most splendid soul, and thou now joinest chorus there with all the saints and angels of God. We therefore fervently entreat thee: Beseech the Master of all, O holy one, that we who glorify thee with love may find rich mercy for our souls. Having assumed my whole form and clothed Himself therein, the Creator and God, Who desired to restore the form of Adam who before had fallen, was willingly lifted up upon the Cross as one guilty; and extending now His hands, He healeth the hands which of old went slack as they stretched forth to grasp the fruit of the tree. Beholding Him, the most pure one exclaimed: What is this Thine ineffable long-suffering, O my Son? I cannot bear to see Thee lifted up upon the Cross, Who holdest the ends of the whole earth in the palm of Thy hand! Come, ye assemblies of the faithful, and in hymns let us honour Olav the King, the valiant warrior of Christ; for, steadfast in the Faith, he was well-pleasing to the Lord, was vouchsafed the crown of martyrdom, and standeth now in supplication before the throne of God on high. And let us cry out to him with love: Come thou, O holy one, stand with us as we celebrate thy memory, and entreat Christ God on behalf of our souls. O pure one, when thou didst behold the mature Vine, Whom thou didst bear in thy womb without being cultivated by man, suspended upon the Tree, thou didst exclaim, lamenting:O my Child and Benefactor, as Thou art compassionate, with Thy divine consolations pour forth the sweetness which taketh away the drunkenness of the passions, for the sake of me who gave birth unto Thee! Desiring the supernal glory of God, thou didst toil for Him to the end of thine earthly life; and, having laboured well, thou didst increase the talant He entrusted to thy care, being faithful to Him even to the shedding of thy blood. Wherefore, as a martyr thou hast received a crown for thy pangs from the right hand of Christ our God, Whom do thou earnestly entreat, that we be saved who hymn thee, O glorious King Olav. At God is the Lord, the troparion of the saint, twice; Glory, Now & ever: Theotokion. Irmos: Bringing battles to nought with His upraised arm, Christ overthrow horse and rider in the Red Sea, and save Israel, who singeth a hymn of victory. Save Thy people, the New Israel, O Christ mighty in battles, that with Thy holy one, the right-believing passion-bearer Olav, we may sing to Thee a hymn of victory. As one mighty, the holy Olav called his people to Christ, lifting up the precious Cross as a battle-standard; and he led them boldly to salvation, singing a hymn of victory. Valiant and brave, the wondrous Olav defended the Faith against the heathen foe, prevailing over them in battle, and singing unto Christ our God a hymn of victory. Theotokion: Eden's delights did we forfeit when Adam, our first father, ate the fruit of disobedience, O all-pure Virgin; but through thy humble obedience we have regained what was lost. Irmos: God is King over the nations. God sitteth on His holy throne. And with understanding we sing unto Him as King and God. The all-powerful God, Who is King of all, set the holy Olav over Norway, that his nation might sing unto Christ with understanding. Heathen idols didst thou overturn and cast into the flames, O saint, for thou didst understand them to be demonic snares. Ye people of Norway, exalt the martyred King Olav with hymns of praise, singing with understanding unto God, the King of kings! Theotokion: Pure and unblemished wast thou, O Lady, like a ewe-lamb fit to sacrifice unto God; wherefore, we hymn thee with understanding. Having attained godly wisdom and understanding, with steadfastness of soul thou didst tend the flock entrusted to thee; and, slain in battle by the pagan hordes, thou didst receive a martyr's crown. Wherefore, we cry out to thee, O Olav: Entreat Christ God, that He grant remission of offences unto those who with love honour thy holy memory. Though I am a lover of sin, O all-pure one, yet do I beseech thee, who gavest birth unto the sinless God Who taketh away the sins of the world, to have pity on my most sinful soul, and to wash away my many sins; for thou art the cleansing of the sinful, the salvation and preservation of the faithful. She who in these latter days gave birth unto Thee, Who wast begotten of the unoriginate Father, O Christ, beholding Thee suspended upon the Cross, cried aloud: Woe is me, O my most beloved Jesus! O my Son, who art glorified as God by the angels, how art Thou now crucified by iniquitous men? I hymn Thee, O Long-suffering One! Irmos: I heard report of Thee, O Lord, and was afraid; I understood Thy dispensation, and glorified Thee, Who alone lovest mankind. Exulting in soul at his baptism, the holy Olav understood the dispensation of the Lord Who loveth mankind, and he glorified Him. Over all Norway, O glorious king, didst thou wisely spread report of the one God, recounting unto all how He loveth mankind. Proclaiming the dispensation of the Lord and the salvation of man, O blessed king, thou didst bring the light of glory to thy people. Irmos: O Lord our God, take us for Thy possession. O Lord, besides Thee we know none other; we call upon Thy name. Shine forth light upon all. Ever invoking the name of the Lord thy God, O most pious Olav, thou didst shine forth the light of the Christian Faith throughout thy realm. Exalting Christ above all, Olav the king abolished the vile sacrifices and laws of the pagans, for he acknowledged none other God than the Lord. Thou didst take possession of Norway, which was given thee by the Lord our God, O holy one, that His light might shine forth upon all thy people. Theotokion: Enlightened by the grace whereof thou art full, O holy Queen, we call upon thee, the fount of loving-kindness: Shine forth the light of God upon us all! Irmos: O Christ Master, still Thou the sea of the passions which rageth with a soul-destroying tempest, and lead me up from corruption, in that Thou art compassionate. Rebellious pagans, sunk in soul-destroying darkness, drove Olav from his throne; but, moved by love for Christ, he returned to triumph over heathen darkness. Nidaros groaned with lamentation when thou wast slain in battle, O pious king; but when thy sacred relics were found to be incorrupt, thy city rejoiced exceedingly. All honour and reverence did thy people render unto thine incorrupt remains, O glorious one, raising up a magnificent church for Christ, wherein to house thy shrine. With the faithful of Norway let us praise the divinely wise king as is meet, for he was a most excellent champion of piety and an undaunted martyr for the Truth of Christ. As he hath boldness before the Lord our God, let us beseech him to ask mercy for us who glorify him, that with gladness we may cry aloud: Rejoice, O ever-memorable Olav! Rejoice, scion of a valiant nation; rejoice, adornment of the people of the North! Rejoice, for in thy youth thou didst embrace the precepts of the Christian Faith; rejoice, unshakable pillar of Orthodoxy! Rejoice, planter and nurturer of the Holy Church in thy realm; rejoice, thou who didst abolish the sacrifices of the heathen and cast down the images of their false gods. Rejoice, good shepherd who didst laid down thy life for the reason-endowed sheep; rejoice, for thou didst willingly shed thy blood for the Lord! Rejoice, for for His sake thou hast been reckoned among the martyrs and received a place in their choir; rejoice, for in thee do all true Christians boast! Rejoice, for throughout the world hath thy glory spread; rejoice, our helper and deliverer! Irmos: All-laudable and all-glorious is Thy name for all ages, O Lord God of our fathers! And all-glorious art Thou, for Thou art righteous in all that Thou hast done for us. King of kings and Lord of lords, Christ the Master hath glorified His faithful servant, Olav of Norway, who planted the Christian Faith in the lands of the Norsemen. 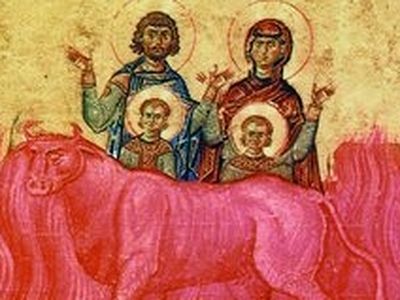 In the heavens the righteous Olav joineth his holy king the wise Prince Yaroslav, the venerable Anna, and the pious Vladimir, their son ever entreating the Lord for our sake. Norway hath shone forth with the splendour of the glory of God, outshining the material glories of the boreal lights in the radiance of the blessed Olav, its eternal king. Theotokion: Glory and honour are ever thy due, O all-immaculate Mother, and deserving of all praise is thy holy name; for thou gavest birth ineffably to the righteous Judge. Irmos: O ye people, hymn Christ the King, Whom the cherubim hymn and the seraphim glorify, and exalt Him supremely for all ages! O ye people of Norway, hymn Christ the King, Whom the right-believing King Olav hath taught you to exalt supremely for all ages! Full of grace divine, the holy Olav exulteth with jubilation, interceding with Christ the King on behalf of the Christian people. Now doth the blessed Olav stand with boldness before the all-holy Trinity, unceasingly rendering praise with all the spiritual ranks. Theotokion: O ye people, let us join with all the heavenly hosts, to glorify the Mother of the Infinite One, and magnify her above all unto the ages. Irmos: With oneness of mind, we, the faithful, magnify thee, the Mother of God, who, in manner past understanding and recounting, ineffably gavest birth in time to the Timeless One. Rouen witnessed thy rebirth in the font of Christian baptism, and Trondheim beheld thy martyr's death, whereby thou didst enter the timeless kingdom, O sanctified Olav. With one heart and one mouth let us magnify the holy king of Norway, who therein sowed the seed of faith for the Lord of the harvest, and hath reaped the wheat of grace in abundance. All ye faithful, form a single choir, and magnify the pious King Olav, who labored with diligence for his Master and hath received from His hand rewards past understanding and recounting. Theotokion: Ye faithful, in Orthodox manner let us magnify the all-holy Theotokos, who in manner past understanding and recounting gave birth to the only infinite and transcendent God. Let us earnestly praise today the royal intercessor for the Norwegian realm: Olav the right-believing passion-bearer, who, zealous with zeal for the one true God, set pagan falsehood at nought and cast down the idols thereof, and boldly preached the Christian Faith, shedding his blood for the Lord. O merciful Queen of heaven, Bride of God, divine Mistress, Mother of the King of all, blossom of virginity, splendour of the angels, adornment of heavenly beings, impregnable refuge of sinners: With fitting laudation we lift our voices to hymn thee, O all-holy one, as our fervent intercessor without peer. 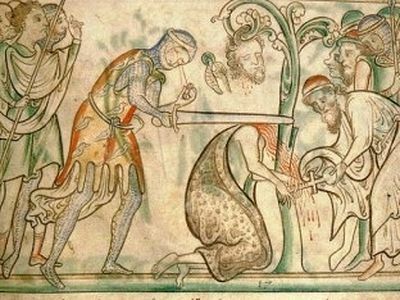 Let us bless wondrous Olav the King, the warrior of Christ, courageous in battle, who in virtue was harder than adamant, the valiant champion of the Church of God, the unshakable tower of piety, who was shown to be a martyr for the Christian Faith, and standeth ever before the throne of Christ, praying on our behalf. O all-pure Mistress, a sword pierced thy heart, as Symeon said, when thou didst behold Him Who shone forth from thee in manner past recounting lifted up on the Cross by the iniquitous as One condemned, given vinegar and gall to drink, His side pierced, His hands and feet run through with nails; and, lamenting, thou didst exclaim, crying out maternally: What is this new mystery, O my Child most sweet? O sing unto our God, sing ye; sing unto our King, sing ye. Stichos: Clap your hands, all ye nations; shout unto God with a voice of rejoicing. Brethren: Be strong in the Lord, and in the power of His might. Put on the whole armour of God, that ye may be able to stand against the wiles of the devil. For we wrestle not against flesh and blood, but against principalities, against powers, against the rulers of the darkness of this world, against spiritual wickedness in high places. Wherefore take unto you the whole armour of God, that ye may be able to withstand in the evil day, and having done all, to stand. Stand therefore, having your loins girt about with truth, and having on the breastplate of righteousness; and your feet shod with the preparation of the gospel of peace; above all, taking the shield of faith, wherewith ye shall be able to quench all the fiery darts of the wicked. And take the helmet of salvation, and the sword of the Spirit, which is the word of God. Stichos: I have raised up one chosen out of My people. Stichos: For My hand shall be unto Him an ally. The Lord said to the Jews who came to Him: Verily, verily, I say unto you: He who entereth not by the door into the sheepfold, but climbeth up some other way, the same is a thief and a robber. But he who entereth in by the door is the shepherd of the sheep. To him the porter openeth; and the sheep hear his voice: and he calleth his own sheep by name, and leadeth them out. And when he putteth forth his own sheep, he goeth before them, and the sheep follow him: for they know his voice. And a stranger will they not follow, but will flee from him; for they know not the voice of strangers. This parable spake Jesus unto them; but they understood not what things they were which He spake unto them. Then said Jesus unto them again: Verily, verily, I say unto you, I am the door of the sheep. All who ever came before Me are thieves and robbers: but the sheep did not hear them. I am the door: by Me if any man enter in, he shall be saved, and go in and out, and find pasture. 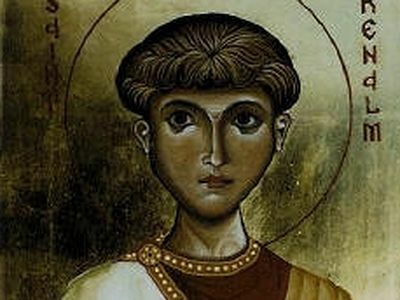 St Alban is venerated as the first English martyr. He was a Romano-British pagan living in the city of Verulamium sometime during the third or fourth century.